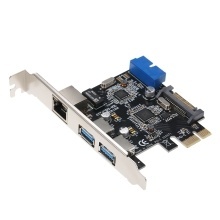 PCI-E to USB3.0 expansion card with one Gigabit network interface and three USB3.0 ports. Widely compatible with various devices, such as flash disk, mouse, keyboard HDD, camera,etc. High speed data transfer and do not need drive to use. It&apos;s an amazing expansion card for you. This expansion card has two standard USB3.0 ports. The backward one can connect devices less used. Forward one can connect devices frequently used. It is quite convenient. This expansion card has one Gigabit port. You can enjoy high speed network. Automatically adapt to 10/100/1000Mbps speed rate. Support various network operation systems. Provide higher performance than traditional PCI network card. Lower CPU utility and amazing compatibility. USB3.0 data transfer speed up to 5Gbos. Downwardly compatible with USB2.0/1.1. Low power consumption and environmentally product. Stable performance.